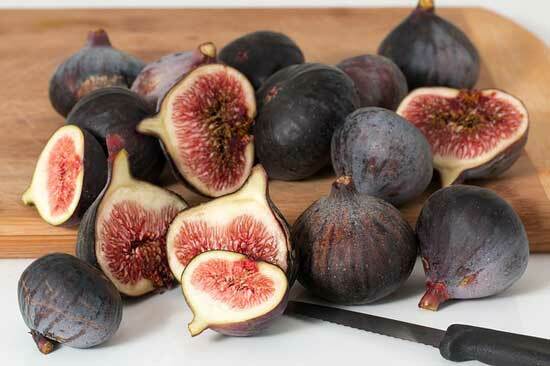 Fig facts, an information sheet for kids cooking activities. Fig facts and general information about figs. Dependent on where they are growing there is usually a summer crop and an autumn crop. Figs are a fruit and grow on trees. Depending on what type you are buying, figs should be a golden yellow color. However you can find some yellow, green, or brown. They should be soft but not mushy when you touch them. Store in fridge. Figs will not last long once they are bought so eat soon after buying. Eat as is, use in baking quick breads or muffins, or as a fruit dessert. Dried figs taste great added into yogurts or cereals. If fresh figs are not available in your area, try dried figs from the dried fruit section in your grocery store. They can be chopped up and used in quick breads, cookies or fruit recipes. Figs are high in potassium and calcium. Cut stems off figs and scoop a little of the insides out. Stuff inside with yogurt or vanilla pudding. In a saucepan, cook fig jam for 1 hour. Stir often. Allow to cool slightly and pour into freezeable containers. Place one in the fridge to use now and freeze other containers. In a glass, 11x8 or 8x8, pan place figs, stems down, until pan is completely filled tight. Prick each fig with a fork in several places to let steam out and the sugar juices to drip in. Sprinkle all with brown sugar and lemon juice. Bake at 300 degrees for one hour. You can serve with ice cream, if desired. In mixing bowl blend sugar, oil and eggs. Have an adult puree figs in blender. Add figs to sugar mixture. Then add cinnamon, nutmeg, cloves, baking soda and salt. Add in flour and milk and stir until well blended. Pour into greased Bundt pan. Bake at 350 degrees for 45 minutes or until toothpick inserted comes out clean. Place butter and chocolate in microwave safe dish and cook in 20 second intervals until melted. Stir until well blended. Pour into mixing bowl. Add eggs, vanilla and sugar. Blend. Then add flour, salt, and baking powder. Mix together. Stir in figs and nuts. Grease 13x9 pan and pour mixture into pan. Bake at 350 degrees for 30 minutes until toothpick inserted comes out clean.